a blog for the exploration and documentation of win-win games in the arts. So we did this performance up in Vancouver (up for me) and by "we" I mean Gabe and I. It was a part of Front Magazine's launch party. It was great! People were sweet and very engaged and willing to actually have a dialog about what we were doing! Of course afterwards it was time to dance. YAY!! I have talked a little about this in the past on this blog but I wanted to re-visit one of my favorite win-win games. I love dancing! I try to go out several time a month and would love to go out several times a week if I could. It can be so many things to different people and that is one of the things about it that makes me happy. Everyone brings their love to it. Whether they love the workout or the music or the social aspect or the getting crazy staying up late party vibe or whatever. Then there are flash mobs! Seems like at one time they were pretty low key and kind of just groups of friends bringing fun to the public sphere. The beauty of this way of dealing with group dynamics and games is that the opportunity for random people to join in and get a taste of the fun themselves whether they are actually "involved" or not. This first video is one that is a little more open the second is a little more performancy but so great anyway and its for Gabe (I know how much you love the Antwerp central station). Part of the reason for this post is that I was recently turned onto an awesome website called Dance Jam by a friend of mine and it really inspired me to try new moves and to really get into being more adventurous and physical. Lately, if I am feeling it, I get way more sweaty and into it than I ever did in the past. I have been feeling way more connected to my body just thru dancing. This may sound like a commercial but as a win-win game it is kind of deep. To be fair, there isn't much I can say that this LA Times article hasn't said in terms of introduction to the Lucky Dragons. I'll trust that you will jump ship via hyperlink and come back having read the article and just go on. I've wanted to mention the Lucky Dragons for quite some time as another great example of contemporary Win-Win. What perhaps held me back is not knowing how to frame what it is that they do. Luckily some experiences from JP and my presentation of Win-Win Games the other night (which was great and which I'll post about soon) helped unlock some ideas. One consideration discussed between JP, Aja Bond and myself of just what made a Win-Win Game different was the notion of vulnerability. The idea that one has to own up to a need for interaction and display a willingness to fail in order to play these games. This reminded me of a phrase which was a bit of a motto for the K records crowd around the turn of the century (Microphones, VVRRSSNN, Bobby Birdman, and Little Wings who's in the video above) and which applies to Lucky Dragons just as well - "emphasize the awkward". While in practice that often seemed to imply emphasizing a collective moment of awkwardness, it actually permeated about everything for better or worse, from conversation to performance to dissemination to subject matter. What was successful about it was that it revealed the process of performance. It spoke to the dependency that a performer had upon their audience and the degree to which they could fail spectacularly in the full gaze of strangers. At times it was manipulative, but often it brought out a collectivity and a hyper awareness of the moment in the audience. In many ways Luke and Sara are continuing in this tradition, what George Chen once dubbed as "Montessori Folk", inducing play in the midst of a very serious process of making music and art. The audience's ability to interject, redirect or abandon the performance and music making does in fact go a long way towards "tak[ing] away any barrier between people," creating "a kind of equality." It's interesting to ask in what ways an artist can create instruments, performances, structures, or frames or props that allow and encourage audience participation while still maintaining a high standard of quality. What makes it possible to include audiences directly in creation and still succeed in the realm of aesthetics? Winter Games (oooh... ouch) are coming to Vancouver BC this March! 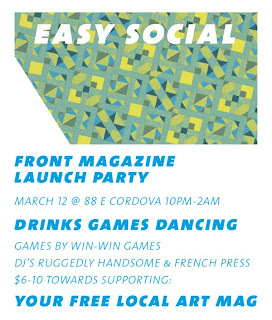 JP and Gabriel, the fellas behind this blog, will be facilitating some Win-Win Games live in Vancouver as part of Front Magazine's March 12 magazine launch party. 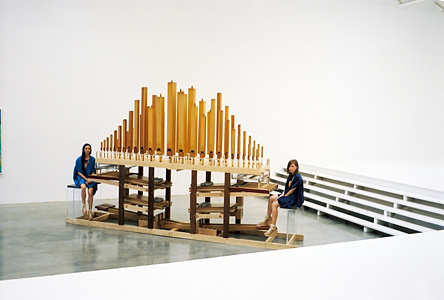 Thanks to the wonderful Root Blog for reminding me of this great sculptural instrument made by some old friends, Cameron Mesirow and Tauba Auerbach. A wonderful example of how design can functionally include Win-Win. For a game to be Win-Win does it have to be fair? Does everyone have to win equally or can some people win more than others? What's gotten me thinking about this is a conversation I recently read in Tamler Sommers' new book, "A Very Bad Wizard: Morality Behind the Curtain". Specifically it involves a a conversation between Sommers and anthropologist Joseph Henrich who conducted some unprecedented cross-discipline game playing with the Machiguenga people of the Peruvian Amazon. Henrich brought what's known in behavioral economics as the "Ultimatum Game" to a small isolated village in South America in the hopes of proving a universal character to morality in human beings. Two players interact to decide how to divide a sum of money that is given to them. The first player proposes how to divide the sum between the two players, and the second player can either accept or reject this proposal. If the second player rejects, neither player receives anything. If the second player accepts, the money is split according to the proposal. The game is played only once so that reciprocation is not an issue. What's interesting, if not jaw-droppingly amazing, is that the vast majority of people who make the proposal offer a near 50/50 split. Even though one would presume that in our dog-eat-dog capitalist world, aka North America, everyone would try to their hardest to test the limits of what they could get away with, acting in their perceived self-interest, assuming that the other participant will do the same. A dollar is a dollar, even if the other jerk is walking away with $19. Yet time and again, most offers made in the wilds of the North American University lab were to split the kitty even. Now fly with me to the tangled jungles of Peru and the shocking discovery that among the Machiguenga people those splits were quite different. In fact they hover closer to 15% as opposed to the 45-50% split up North. The people participating in the Amazonian version of the game felt little or no resentment towards the other participant either, generally seeing them as just lucky given the circumstances. I wont get into the explanation for this phenomena that Henrich offers, or the philosophical implications in regards to morality, as these are dealt with much better in the book. What I want to discuss is the question of what "fairness" means in the context and what exactly is the effect of an uneven split on a Win-Win game. In other words, just how much does everyone have to win for it to be a Win-Win game? As I've been exploring the concept of Win-Win games in the arts, I've also been slowly attempting to articulate a definition of what is a win-win game. In my mind I've been developing a list of "rules" to distinguish what is and what isn't a win-win game. After many conversations and considerations I've come to the conclusion that "participation" is not enough for me to identify something as win-win. Though participation is essential, and the introduction of participation can often be the catalyst for transforming an experience towards being Win-Win, I think there is a particular type of participation that is actually of the nature of Win-Win. In a way, this is an affirmative response to a post JP made a while back. I would argue that a good Win-Win game doesn't have a hierarchical structure - a conductor or facilitator leading a group in a form of group play. If that role is built into the game, it has to be absolute permeable and interchangeable - the role can be spontaneously assumed by anyone according to flow and inspiration. For simplicity sake I would call this Horizontality. This is especially crucial to fulfill another characteristic of Win-Win Games that I also think is essential - Reproducibility. A good Win-Win game can spread as a meme, being instantly transferable through experience, and ideally easily and affordably reproduced by anyone. This is where the dependency upon an expert, a leader or a person with a specific knowledge base becomes a critical dysfunction of the game. If we take the example of Bobby McFerrin (already much celebrated on this blog), while his examples of spontaneous group composition suggest a potential form of communal play that perhaps could be replicated under other circumstances, its performance only allows for One person to conduct, and raises the question of whether just anyone actually could conduct in this way. Though I wish I could make this point with an affirmative example of Horizontality, for now I'll resort to a reductionist example of the opposite of what I believe ought to be a critical part of a Win-Win Game. Win-Win games work when they have nothing but participants. Perhaps the best examples also allow for non-participation as an act of participation, but in my mind successful play is co-created and co-organized by the players and doesn't leave anyone out, nor does it situate any one player in the role of leadership.